IMPORTANT: Notifications & Monitoring are specific to your Stage and Production accounts, so you will need to set up in both locations when the time comes. 1. Navigate to Settings --> Notifications. 2. 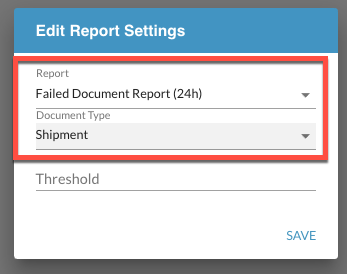 From the Notifications page you can select all the reports and notifications you want emailed to you (toggle to red). 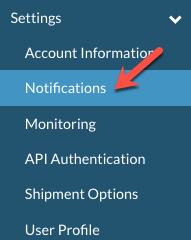 By default, when a user is set up, they will be configured with a default set of notifications. You can unsubscribe from a notification simply be turning the switch off (toggle to grey). 3. Before leaving the page, you must click Save to update your notification settings. We recommend that most users should set up a failed shipment monitoring alert. 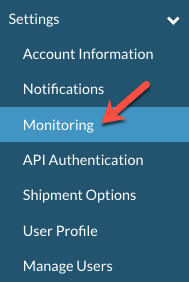 Additional monitoring alerts can also be set up (such as failed invoice, acknowledgement, etc.). 1. Navigate to Settings --> Monitoring. 2. From the Scheduled Report Configuration page, click on Add Report. 4. The configuration now appears on the Scheduled Report Configuration Page. Other configurations can be added as needed.